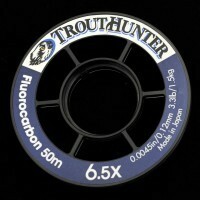 TroutHunter Fluorocarbon was declared Overall Champion of the “2012 Tippet Shoot Out” in Fly Fisherman Magazine, receiving the highest possible score in spool design, honesty in advertised strength, abrasion resistance, invisibility to fish, casting accuracy, and expert angler’s preference. Nearly invisible due to its low reflective index, this double structured fluorocarbon is designed to create strong, durable knots to all tippets, while providing remarkable break strength for its diameter. Don’t bring a knife to a gunfight—get the hunter’s edge. Whether nylon or fluorocarbon, TroutHunter tippet material offers unsurpassed strength and reliability. Our leaders afford the angler unprecedented levels of turnover and control. TroutHunter Fluorocarbon won the fly fishing industries "Dealers Choice Award" & won 1st Place at the "George Anderson's 2012 Tippet Shoot Out". Many features in our tippet spools and packaging system are unique and specific to the innovation of TroutHunter.